According to the research published by the science journal Organizational Behavior and Human Decision Processes, we (the human beings) have a natural tendency to select people with general skills when specialized skills are required. The research, conducted by Long Wang of the City University of Hong Kong and J. Keith Murnighan of Northwestern University, suggested that a Specialist might be someone who can do one thing – but do it really well. Yes, gone are the days when one person could do everything. Specialists are required in every sphere of life these days – from the Business World to Organized Sports, from Data Science & Big Data Analytics to Medical Surgeries, and from Personality Grooming & Image Consulting to College Admissions Counseling. There is no dearth of information, insights, and help. Then, there is a High School Counselor. 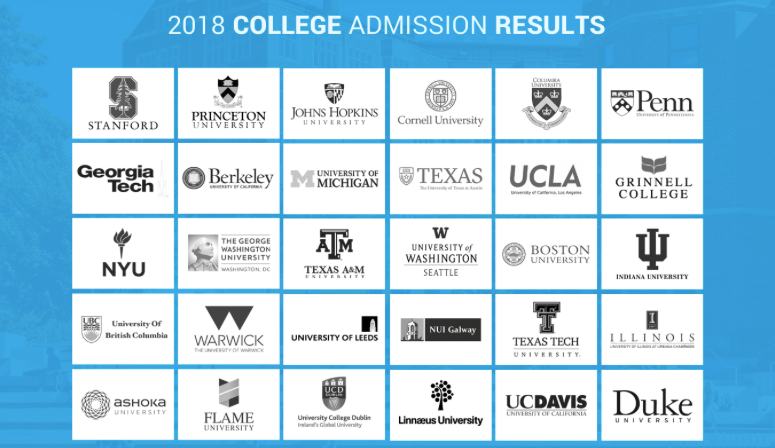 So, why hire a professional college admission counselor? In one way, it’s like hiring a tutor or sending your kid to a coaching center even though the kids have got school teachers – to get expert, personalized and specialist guidance (basically, services). But, isn’t the cost of hiring an external professional college admission counselor too much for the Indian parents? Yes, there is definitely a cost and a significant one. But, not seeking specialist help or hiring the wrong admission consultant might cost you more in the long-run. A 4-year undergraduate degree from the US will anyway cost you something between INR 60 Lacs to 2 Crores. The majority of professional college admission counselors charge around INR 1.5 Lacs to 12 Lacs. If you work with the right (not necessarily the best) admission counselor, you could save INR 15 – 50 Lacs in the form of financial aid & scholarships. Please be advised that the high price tag of a counselor doesn’t guarantee admission to the Ivy League Schools or the Elite Colleges. Similarly, the lowest price doesn’t necessarily mean the services are of the lowest quality in the market. It’s all about the right-fit and customization. But, we are not exclusively aiming Ivy Leagues and/or Elite Colleges. Why should we opt for premium college admission counseling? Hiring an independent college admission counselor is not only about sending your kid to prestigious schools like Stanford, Princeton, Harvard, Cambridge or Oxford. College admission counselors DO NOT possess any Magic Wand. As a parent, you should hire an admission consultant if you want to send your child to choose the best possible career path by attending the right college. There are more than 100 Tier-1 Colleges across the USA. People hardly know about the good colleges that are lesser known. Additionally, many public schools also offer generous scholarships to international students. So, how to identify, decide, and get admission to those colleges with the required amount of financial aid? This is where the specialist college admission counselors will help you. Now let’s see what parents and students, who worked with professional college admission counselors, have to say about the college admission counseling services. Please note – these are the feedback from the Parents (and Students) who worked with Team Stoodnt. We are not saying that you must hire us (well, if you do, we would be more than happy). The idea behind this article is to give you insights into hiring and working with independent & professional admission consultants. Feedback from Sanjay Malhotra, Father of Ruchit Malhotra – who got admits in UC Riverside, UC Boulder, and few others. 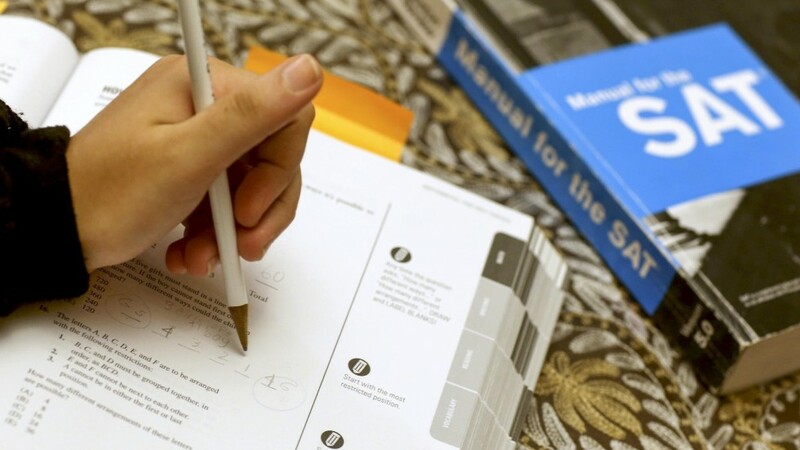 How did Team Stoodnt help the student with the understanding of US college admission process? Team Stoodnt helped us to make critical and important decisions with respect to the admission of my son, usually everyone is an expert and you get all sorts of sharing of experiences/advise, Google is full of advice and answers, however, each case and every individual is different and often such experiences of others do not apply or are unfit in your case. We were fortunate to be guided by Stoodnt in an extremely professional and intelligent manner, their advice is tailor-made and customized to your individual case and on each occasion, we derived value from their advice. Stoodnt had a tailor-made program for my son which was thoroughly discussed and made almost fool-proof from their rich experience in the subject. 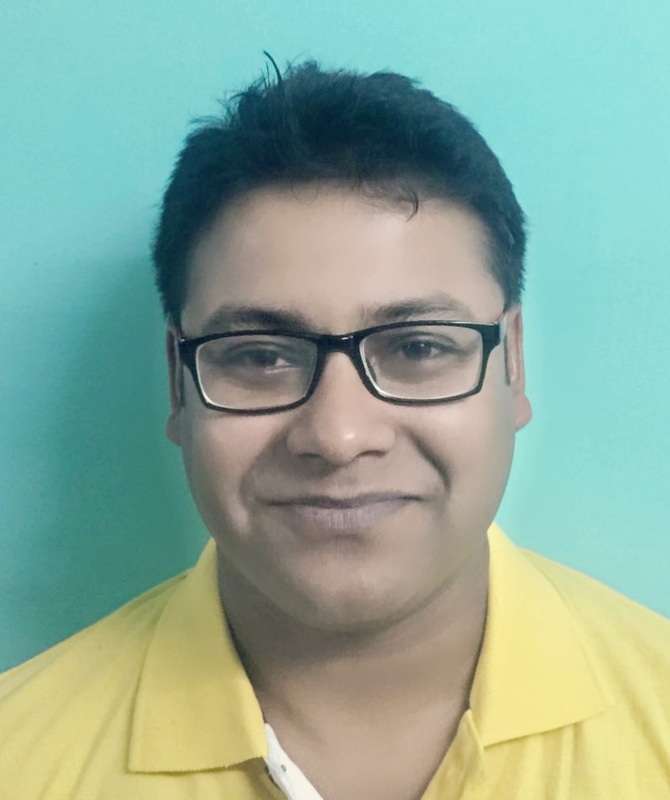 The experience and help from Stoodnt brought out the best in Ruchit, they don’t have a copy and paste solution but know how to guide you and extract the best out of you. If they faced any issues with remote counseling? After all, the majority of Stoodnt Counselors are based out of the US, Canada, Singapore, UK etc. No, rather it saved time in terms of local commuting and we received authentic advice without venturing out of our house. Did you find any add-on value in comparison to School Counselors and/or Conventional Study Abroad Counselors? Absolutely and completely! !, the value addition is world class, I have booked Stoodnt for counseling the next child in our house. Related Article: Why Universities in California Offer Great Value to International Students Looking to Study in the USA? How did Team Stoodnt help you with profile building? Team Stoodnt helped me build my profile by advising me on how to present my achievements, and what parts of my profile to showcase and which ones aren’t relevant enough to help me out in the admission process. I was looking at colleges in locally in the state of California before Stoodnt and didn’t know anything about out of state colleges, but Universities within the State of California had tuition prices which would have been hard to afford as an International Student. 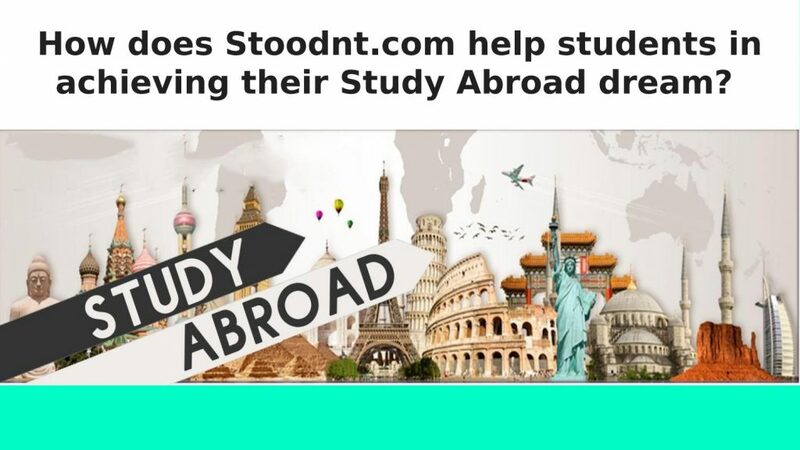 Stoodnt helped me find affordable and good study options outside California. 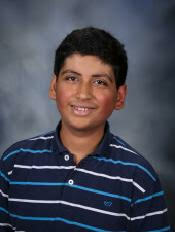 The team at Stoodnt was very responsive and helpful in the process of me writing the College Admission Essays. They were willing to work and critique my essays and helping me show my best self, and reflecting upon things I did wrong. Did you face any issues with remote (online) counseling? The amazing counseling services provided by Stoodnt didn’t leave me with any negative experiences. Did you find any add-on value in comparison to School Counselors and/or Traditional Study Abroad Counselors? While School Counselors are good, they often operate in a very local sphere of influence, which often leads them to miss out on opportunities outside the sphere, namely the State of California, in my case. I found Stoodnt’s one on one counseling sessions very helpful, something that most School Counselors were not able to provide their students. 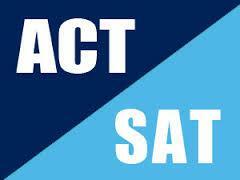 Experience with the Overall Process (PathFinder + SAT/ACT Prep + College Admission Counselling) and the Counselors. My overall experience with Stoodnt was amazing, the helpful and responsive counselors, along with the College matching service, which helped me find an affordable University with Quality Education. I would recommend Stoodnt to every high school senior, who’s feeling lost in the college admission process. 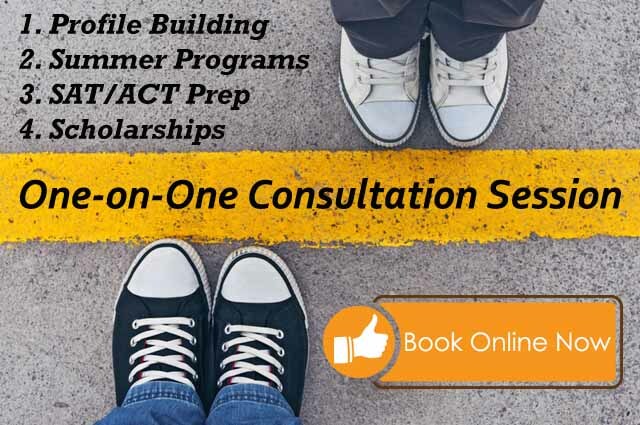 Want to Speak to a College Admission Counselor? Book a Personalized Session (30/60-Minutes)! 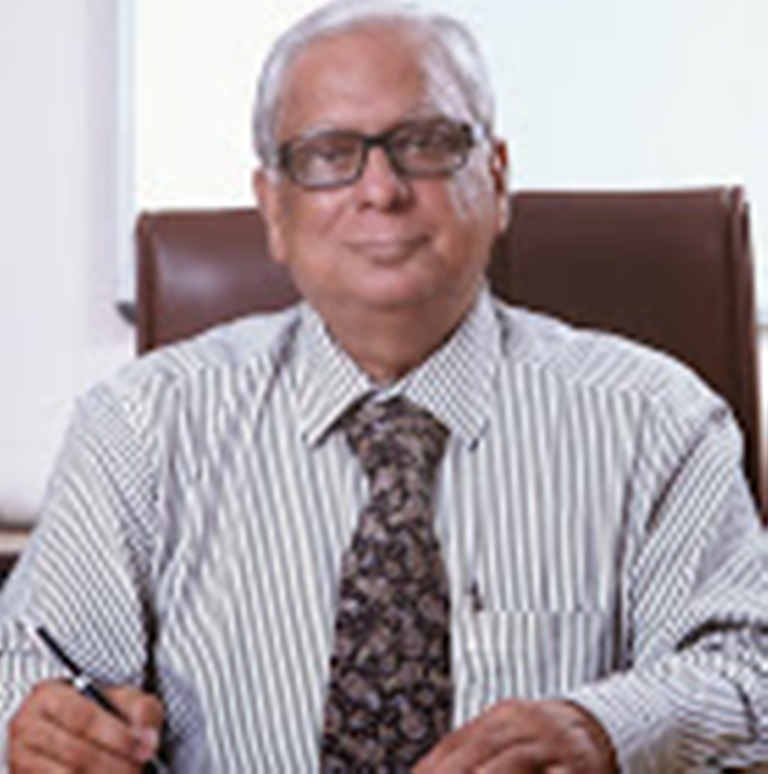 When I planned US education for my daughter Minal Chawla the first time the prospect of applying for the universities in the US looked very daunting but then I got to know about Stoodnt through a seminar conducted by Richa mam and I was really impressed by their services and decided this as the right place for my daughter Minal. My association with the Stoodnt team has been an overwhelmingly positive experience. Richa mam, yuri sir and Tandra mam all helped Minal to identify her carrier interest, conducted multiple counseling sessions to plan the applications to various universities. 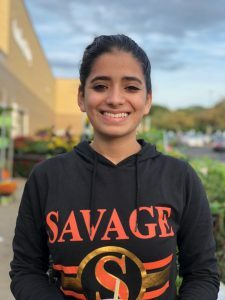 With their guidance she received acceptance letters from all the universities she applied to and finally, my daughter selected Stony Brook University at the United States. I have started my college at Stony Brook University and today was the first day of my classes which went well. I am going to keep Biology as my major and I am dorming on campus. I sincerely want to thank you all for your guidance, support, and encouragement throughout the admission process. Thank you for always guiding me through this and without your support I wouldn’t have been able to reach here. As we wait to board our flight to the US, I want to thank each one of you for your support, encouragement, advice, feedback, and inputs in refining the essays and always being available for making Aditi’s dream come true. JHU was one of her dream schools for the longest time. Anjali, thanks for understanding Aditi, her likes, dislikes, mood, and preferences, essentially what makes her tick to be able to draw the college list that would suit her personality the best. Over the last one year, you became a close friend who she never hesitated to reach out to. As you can see, each kid had a different profile, different aspirations and varying needs of college admission guidance they needed. 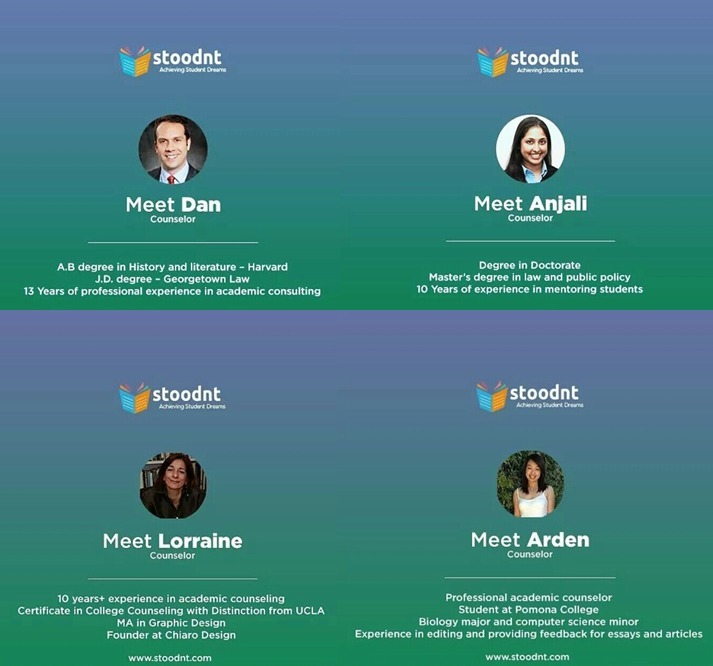 Team Stoodnt was able to help students from Ivy League aspirations to students who wanted to study at good public universities, US or across the world. The number of Indian students enrolled in the US increased from 50 thousand in 1995 to about 150 thousand in 2015. The acceptance rates at the top colleges are getting to single digits. In contrast, there are many other top-notch colleges (with generous financial aid for international students) that people don’t know about. 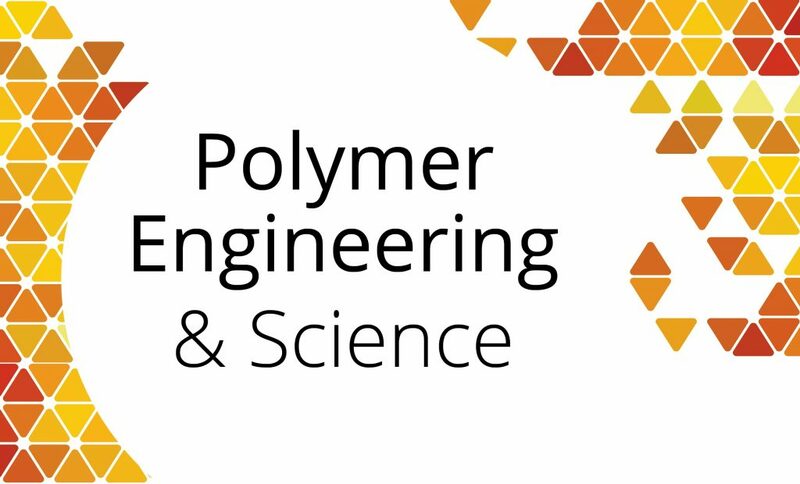 For example, if you are looking for the top engineering schools in the US for undergraduate studies, colleges like Harvey Mudd or the Cooper Union are placed over Harvard for undergraduate education in engineering in the US (U.S. News). Getting into top schools with a strong brand name is good. But, there is no point in chasing after them blindly; and definitely not by paying $10,000 to highly-sought after consultants. At the same time, don’t ignore admission consulting altogether. Rankings and reputation are important, but up to a certain extent. Don’t just apply to the known college names. There are hundreds of good colleges, but a few that may be the ones which fit your interest, profile and where you may have a good shot of admissions. Working with professional admission consultants could be a great way forward. At Stoodnt, we put the maximum emphasis on WHAT’S RIGHT FOR THE STUDENT. Additionally, we provide personalized guidance services according to the kid’s requirements. At the same time, we do also take care of your budget for admission consulting services. We are not among the cheapest admission counseling firms in the market, neither the most expensive ones. We have packages that range from $2,500 to $5,000 for comprehensive guidance. 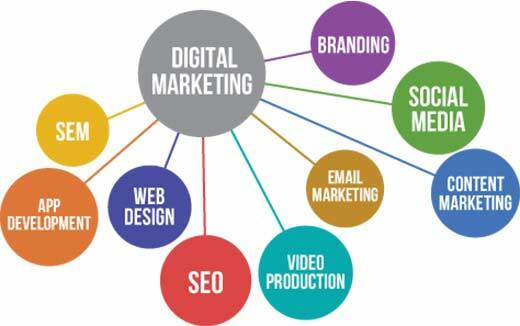 Similarly, we also provide byte-size customized services that cost as low as $500. Need college admission guidance for your child? Get in touch with us!